Banded Stilts feed on a range of invertebrates (including brine shrimp and snails) at saline wetlands across southern Australia. Such behaviour has been a mystery for decades; described for the first time in 1930, just 30 breeding events had been documented for the entire species in the following 80 years. To investigate this behaviour, and to assess the stilts’ conservation status, we began a study in 2011, during which I was based in outback South Australia, ready to jump into a small plane after every large desert rainfall. We also satellite-tagged nearly 60 banded stilts, using miniature solar powered devices around half the size of a matchbox. Sixty banded stilts were tagged with solar-powered satellite trackers. This focused survey effort – which required overcoming the logistical challenges of very remote sites, knee-deep mud, heat and flies – has revealed major new insights into how banded stilts breed and the incredible distances they travel: we recorded one bird that flew 2,200km in just two nights. The research revealed that, on average, banded stilts respond within eight days to unpredictable distant flooding of outback salt lakes. They leave their more predictable coastal habitat to travel 1,000-2,000km in overnight flights to arrive at the newly flooded lakes and take advantage of freshly hatched brine shrimp. Brine shrimp eggs lie dormant in the lakes’ dry salt crust for years or decades between floods, but upon wetting they hatch in their billions, creating a “brine shrimp soup” – a rich but short-lived banquet for the nesting stilts. Banded Stilt nests, with clutches of eggs representing over 50-80% of female body weight, litter an island in recently flooded Lake Ballard, in the Western Australian Goldfields 2014. During the six-year study, we detected this nomadic movement and nesting behaviour seven times more often than it had been recorded in the previous 80 years. Although the banded stilts were previously thought to require large once-in-a-decade rains to initiate inland breeding, we found that small numbers of banded stilts respond to almost any salt lake inundation, arriving, mating and laying eggs equivalent of 50-80% of their body weight, despite high chances of the salt lake water drying before the eggs could hatch or chicks fledge. Many times the eggs were abandoned as salt lake water dried. On other occasions some chicks survived long enough to learn to fly – although late-hatching chicks ran out of food or water and starved. Once we found out that stilts needed much less rain to breed than previously thought, we used satellite imagery to reconstruct the past 30 years of flooding for ten salt lakes in South and Western Australia. These models showed that conditions have been suitable for breeding more than twice as often as breeding events have actually been recorded. It seems that stilts’ nesting behaviour is so remote and hard to predict that scientists have been missing half the times it has happened. Salt lakes in northwestern Australia are vital for banded stilts’ breeding. Our satellite tracking showed that birds from across the continent can reach these lakes after rain. Satellite images also suggested these lakes fill with water much more frequently than southern breeding sites. These lakes are also largely free of native silver gulls (the common seagulls seen around our cities), which are predators of stilt chicks. Silver Gulls fighting over a banded stilt chick on Lake Eyre. These gulls found in Australian cities also fly inland after rain and can decimate some Banded Stilt breeding attempts – eating thousands of eggs and chicks. But other southern Australian breeding lakes are dramatically affected by gull predation. In one instance, a colony of 9,500 pairs (around 30,000 eggs) had less than 5% of its chicks survive, despite abundant water and brine shrimp on offer. Observations made near the colony suggested that a chick was being eaten by gulls every two minutes. Nearly 900 chicks and 350 eggs were eaten in the 30 hours we watched the colony. Unfortunately, even the lakes that are relatively gull-free are now under threat from human development, despite being in one of the most remote parts of the world. Lakes Disappointment, Mackay, Dora, Auld and others surrounding them in the Little Sandy and Great Sandy Deserts are the subject of plans for potash mining. The most advanced plans relate to Lake Disappointment, where Reward Minerals plans to construct a series of drainage trenches and 4,000 hectares of evaporation ponds on the lake bed to harvest potash for use in fertilisers. This action will create permanent brine pools in some parts of the lake, and prevent other areas from receiving any water. As surface water drains into evaporation ponds, it’s likely the first rains after a long dry spell will no longer prompt mass brine shrimp hatching. Without this brine shrimp “soup”, banded stilts cannot breed at the site. A tiny island on Lake Torrens SA, covered by 70,000 Banded Stilt nests in 2010. Meanwhile, the coastal habitat that supports banded stilt for the rest of the year is also changing. Sites that are home to thousands of birds, such as parts of the Dry Creek Saltfields and Bird Lake in South Australia, have been drained in the past two years. If both the stilts’ inland breeding and coastal refuges are under threat, how can they survive? This research offers insight into the conservation of highly mobile species, which may travel hundreds or thousands of kilometres in a year. Banded stilts are listed as vulnerable in South Australia, but have no conservation rating in the four other states in which they are found. Individual banded stilts appear to operate over vast spatial scales, crossing between state jurisdictions in single overnight flights. Their episodic breeding events are hard to find and even more difficult to manage. Between breeding events, long-lived adults depend on refuges around the country which are being impacted by human activity, including potentially longer, harsher dry periods from climate change into the future. These birds epitomise adaptation to unpredictable changes in their environment, but habitat loss and a warming climate may threaten them as much as any other species. 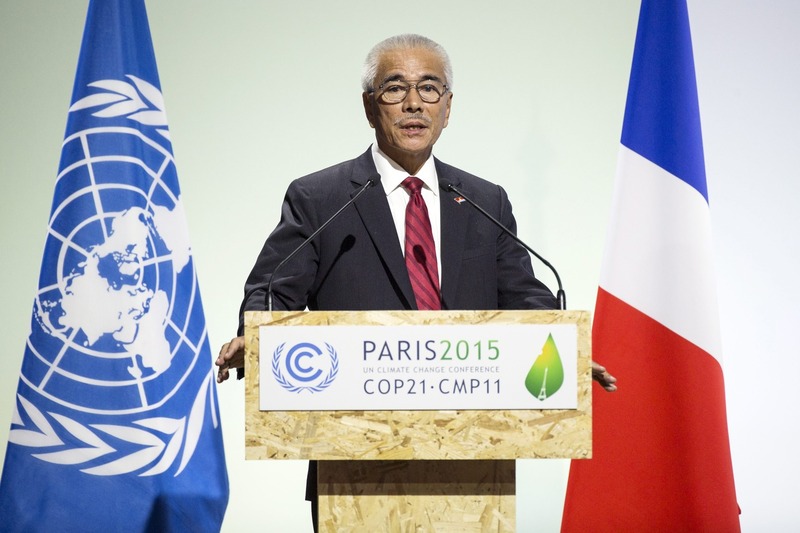 Kiribati’s president Anote Tong addresses the opening of the Paris talks. How will climate change affect life in the oceans? In research to be published in Nature Climate Change* we, among several other authors, show that the answer is likely good and bad. Our study models how species might move in response to different future climate scenarios. The good news is that overall, thanks to species migrations, most places will end up with greater numbers of species. According to our models, climate change is unlikely to directly cause extinction through warming waters for most species, except for those that can’t move or have very narrow thermal tolerances. The bad news is that there are a few very special places that will lose species – particularly the spectacular ocean ecosystems of what’s known as the Coral Triangle, the epicentre of global marine biodiversity. As ocean temperatures increase, marine life will likely move towards the poles – animals and plants will expand their ranges. We can already see this happening. In Australia, tropical species of fish are turning up in northern New South Wales. We wanted to know how this would affect the overall numbers of animals and plants in the oceans – marine biodiversity – and the distinctive communities they comprise. While many things affect where marine life lives – habitat, competition, salinity – most species are affected fundamentally by temperature. Using temperature to find out where species might move allowed us to look at an unprecedented number of species – nearly 13,000. These included animals and plants as diverse as fish, corals, jellies, snails, clams, crabs, shrimps and seaweeds. We looked at two different climate scenarios, business as usual (known as RCP8.5) leading to warming of around 2.5ºC by 2100, and a scenario with medium mitigation (RCP4.5) leading to warming of around 1ºC over the same period. Our model shows how fast different temperature zones will move and to where, using a measure known as “climate velocity”. This is a good way of predicting where species could move because it traces pathways connected by climate. We should emphasise that our study shows where species could move. Our projections don’t necessarily mean that they will move, nor that they will successfully establish themselves at the locations where they arrive. That depends on a variety of factors, including their specific habitat requirements and how species interact with each other. But studies of invasive species suggest that species that can move will tend to do so. Overall we found that biodiversity of the oceans will likely increase at local scales. As a result, we anticipate that marine ecosystems will become more similar. For instance, today on the east Australian coast, the types of species found along the central Queensland coast are quite different from those found in central New South Wales. As sea temperatures warm, we expect those boundaries to gradually break down, leading to what we call a “smearing” of biodiversity. There are several theories as to why there are so many species in the tropics, and especially the Coral Triangle. Irrespective, we know that this area supports over 500 species of reef-forming corals, together with a massive diversity of fish, including whale sharks, and six of the seven extant species of sea turtles; it is also visited by many species of whales and dolphins. This concentration of marine biodiversity contributes significantly to livelihoods of the region’s 120 million or so human inhabitants. Species living in tropical seas already live close to their thermal optimum. As temperatures increase, they will exceed the upper thermal limits of some species. When this happens, some species will adapt, for instance by seeking out micro-refuges, such as small patches of cool water caused by upwelling, or they might resort to living in deeper waters, if the water is clear enough. But in the long term, most species will need to move. The reason we expect marine biodiversity to decrease in the tropics with warming is that there is no place warmer to act as a source of new species to replace those species moving out. More than 5,000 of the 13,000 species we looked at in our study are found in the coral triangle. According to our projections, approximately 500 to 1,000 of these species will leave the region thanks to warming waters under RCP4.5 and RCP8.5, respectively. Our modelling shows that the loss of marine life is strongly related to how much we mitigate climate change. Even if we take only intermediate levels of action (under scenario RCP4.5), we can minimise the damage. But we can’t eliminate it entirely: under the emission-stabilisation RCP4.5 scenario we anticipate that the Coral Triangle will lose roughly half as many species as under the business-as-usual RCP8.5 scenario. We can also look at how we manage the world’s oceans. Some regions, such as the northeast Atlantic and eastern Mediterranean, have seen greater impacts from people than others, and some of these overlap with regions likely to be affected by climate change. Where there is overlap, we can look at alleviating the damage caused by people, such as pollution of coastal waters, or minimising the pressure on key species, for example by reducing fishing pressure on them. In other areas, such as the poles, there is low human impact, but we project substantial changes in biodiversity. From a conservation perspective, we want representative sections of these areas to remain free from additional human pressure, for instance by using regulation to control future development. And because climate change doesn’t respect national boundaries, all of these efforts will require international cooperation. Only in that way will we ensure the seas remain rich and healthy in the future. *Update August 25: the paper on which this article is based has not yet been published. The article will be updated when the link is available.